This is my new blog. Like a home you have just moved into with boxes left unpacked and walls unadorned, but where the daily activities of life have already begun, I post before setting up any aesthetics for kassiblog. I am too eager to get this information out! I often write on Facebook about politics, especially pro-life politics, Catholic Church teaching on these issues, and related things. I wanted a way to potentially reach more people, so here it is. This blog will likely be on-again off-again (so subscribe!) as I wear many hats and want a purpose to be served when I post. But when things are getting hot down in Austin and pro-life or anti-life legislation is at hand, it'll be smoking over here! At my husband's advice, I'm just going to hit the ground running. My Facebook friends and those who know me in the real world will have a context. Those of you who may be new (and I hope you will be many in number in time), I think where I stand will be apparent soon enough. I seek to provide an objective analysis of issues and legislation from a solid Catholic morality. I am not a theologian, I am merely an attorney who reads and analyzes - A LOT - from matters of the faith to politics to legislation. I am not tied to any particular group or lobbyist and am beholden to no legislator. I am just me doing the best I can to help us work through the issues so we come out at a pro-life result consistent with our Christian faith for the betterment of society. Finally, a note on comments: I do not intend to enable them. Why? Because life is too short. I seek to provide information, not controversy, and drama. I hope everyone will thoughtfully read what I post here and then do with it what you will as is your right. I'm going to hit you with a lot here. That is my way. Grab your caffeinated beverage of choice, print the blog post out if it's easier to read, but let's do this. These are confusing times. As we work through the Bob Hall vs. incumbent Dr. Bob Deuell race in State Senate District 2, the issue of SB 303 comes up time and again - as well it should considering the stakes. SB 303, authored by Deuell, was an attempt to amend the Texas Advanced Directives Act; a very bad attempt that would have made the horrible existing law much worse. As a Catholic convert, it pains me that the Texas Catholic Conference of Bishops ("TCC") supported (and continues to support) this legislation (the details of which you can read about in a link I provide below). The TCC lobbied for it, testified for it including having a Bishop testify for it, and have attacked groups that opposed it, especially Texas Right to Life. Their Twitter tweeters attacked my husband and I personally (as did Texas Alliance for Life's people and Sen. Deuell himself and/or his people) when we tweeted opposition to it providing facts by citation to the language of the bill itself that disproved what the supporters claimed. They never attacked with bill language to prove that it was a good bill; they attacked based on talking points unsupported by the bill language. As we enter into early voting in this race and the campaigns are busy making their cases, SB 303 has come up. Again and again - the bandwagon fallacy; the appeal to authority fallacy; the error of clericalism - make their appearance and faithful well-meaning Catholics (and non-Catholics who look to those who endorsed the bill) point to the TCC's support of this fatally flawed legislation as a reason why it must not be bad and must, therefore, be pro-life, and why Deuell is worthy of re-election. Let's talk about the implications of this and work through it because the implications are huge for the next legislative session. Clericalism is basically the bad idea that only the ordained and religious are fully Catholic and that laypeople are more or less second-class. With that idea comes a host of other bad ideas, such as "Father is always right," "Never disagree if a bishop does it," and "Don't question anything a priest or bishop does." It is of no benefit to you or our clergy to do this. It is not right that you do not look into issues in great detail and rely on endorsements and talking points from various groups. Those are helpful only after you've worked through the language of the bills or the details of the issue. Experts are helpful, of course. But that should not necessarily be the last word. Where there is much disagreement, there is more work for each of us because it is even more imperative that we figure things out on our own. Again, more on clericalism in the context of SB 303 later. Second, Bishops (as anyone can be) are just sometimes wrong on things and you simply have to dig deeper on your own and find the truth. A Conference of Bishops does not speak for the Church universal. I recommend that each person go to Bishop Emeritus Gracida's blog (abyssum.org) and search under SB 303. You will find a host of information from a Catholic (and just plain pro-life) viewpoint as to why the TCC and others are wrong to support this legation and anything like it. Sadly, the TCC is misinformed on this point and has been for a long, long time. Bishop Gracida pointed out in 1990 that the TCC was wrong on this issue. The TCC and Bishops have continued in that error and have caused much scandal by so doing. The passage of time does not correct an error. The TCC - those Bishops that signed onto this legislation, as well as their lobbyists - need our prayers and fraternal correction. Third, the language that some quote from the TCC as supportive of this legislation is dangerous, inappropriate "death with dignity" language that finds no support in documents from the Magisterium. Friends, this is not pro-life. This is a frightening, shocking, and appalling statement made all the more so by the name behind it. It is also not supported, in letter or spirit, by Church teaching. Read the most applicable Church documents on this issue cited here where I discuss the "circular firing squad" that is the cadre of supporters and claimed drafters of this legislation. Fourth, let us look to and learn from history. Remember that most Bishops in Europe were tainted by the Arian Heresy and that issue - the divinity of Christ - was a far easier issue than this. Neither Bishops nor their Conferences are infallible, nor do they speak for the Church as a whole. With regard to the Arian heresy, it was a well-formed faithful laity that provided a foundation upon which the Pope and St. Athanasius could summon the Bishops to correct them and set the record straight during the Council of Nicea. You will also find discussion of the laity's involvement in the Arian heresy in the Mark Shea article I posted above. I think we can look to this episode of history as an analogy, a warning, and a roadmap applicable to the denial of care/end-of-life issues that the TCC (and other organizations, including the Catholic Pro-Life Committee of North Texas here locally) are getting wrong to the detriment of patients' lives. But part of the way to deal with such things to become well-informed ourselves - as to the issues and true Church teaching. Fifth, a comment on the term "death panels" that so many seem to object to: Those that supported SB 303 supported the continuation of ethics panels that make life and death decisions for patients. There is simply no getting around that fact. Supporters may not like the term, but the hospital ethics panel has the authority to determine that a patient's care (including, contrary to what TAL and Deuell say, **withdrawing artificial nutrition and hydration**) will be discontinued resulting in his death. In other words, the panel can decide death for a patient with no due process for the him or his family. I wrote about both of these things on Bishop Gracida's blog as did others. That is the law now and that would have continued to be the law under SB 303. PLEASE NOTE: When I talk about denial of care, I am not talking about continued "extraordinary care" (like chemo, radiation, etc., which at some point can become rather futile or more burdensome to the body than the body can any more tolerate) but "ordinary care" - basic nutrition and hydration - food and water - that may need to be administered artificially (through IVs, feeding tubes, etc.) There is a big difference here. We simply do not starve or dehydrate to death sick patients. That is not pro-life. But in either circumstance, I do believe that that patient or family must be consulted and must consent. The doctor or hospital or ethics committee should not make the decision for you and certainly not against your will. 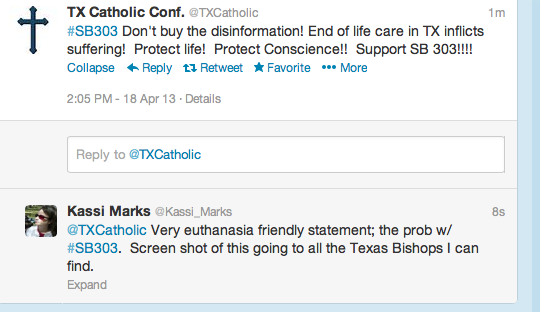 This was retweeted by the Texas Medical Association which is not known for being pro-life. This is dangerous. The current law gives, and SB 303 continued to give, doctors many layers of immunity from lawsuits. There is no challenge to their decisions except to a medical ethics board within the hospital where they are treating (but wanting to withdraw treatment from) you or your loved one. There is no higher appeal. There is no way to hold them accountable. The results are final - and, yes, sometimes deadly. If a doctor no longer wishes to treat, the patient should be treated until transferred to anther doctor or facility. Why a doctor must have the authority to withdraw care just because his "conscience" tells him to does not make sense and has never been explained. Like most people and most professions, different doctors may have various medical opinions about how to treat a patient or what his prognosis is. Patients deserve that opportunity but inexplicably the TMA, Deuell, TAL, the TCC, and other SB 303 supporters believe it is completely appropriate for a doctor or committee to refuse treatment, limit the time you have to transfer, and then withdraw it before you can be transferred. They steadfastly refuse to require treatment until transfer as a matter of law. Sixth, why do I keep posting and referring to my own links? Because people keep commenting in various places that they have read the legislation and find nothing wrong with it. I submit that not everyone can find the issues lurking in legislation meant to hide its true meaning and purpose. I trained for this; I do this every day. The law is complicated and nuanced. Tiny words that in many contexts mean nothing change everything in the law. Let me help you through this process. Further, I know of no one else that went section by section and word by word as I did for those sections that SB 303's supporters claimed were so benevolent. When confronted with my analysis, NOT ONE SUPPORTER took issue with it. They took issue with my opposition in general, but they avoided specifics. They relied on their bullet points and summaries. They are today as they attempt to re-write history to support Sen. Bob Deuell's re-election campaign. SB 303 supporters could not and did not look to the bill language itself as refutation. That should tell you something right there. I parse bill language here. And here I talk about the lack of due process here. 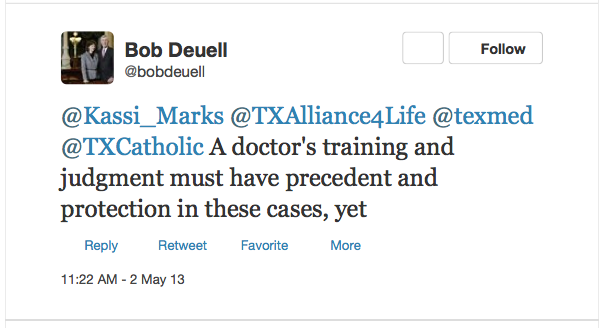 So, if you think that SB 303 is great; if you think that it's worthy of support; if you think Deuell should be sent back to Austin to try this again when there is a pro-life alternative who understands that the end of life (or just very sick patients who might not be at the end of life but are threatened by denial of care) need as much protection as the beginning; if you think that it's not big deal BUT you have not done the hard work of slogging through it in a meaningful way - parsing every "except" and "unless" and permissive vs. mandatory term (like "shall" vs. "may") - then you put yourself and others at risk - morally and possibly even physically. If you live in Senate District 2, I urge you to consider this issue very carefully as you cast your vote. I do not live in that district, but I think refusal to treat and end of life issues are a tremendously important part of the pro-life movement. Deuell may have helped do some pro-life things, but that does not give him free reign on this issue to do what is absolutely not pro-life. It is complicated, but that does not mean that we are absolved of our duty to do the right thing and learn the issues. Most of all, please pray for each organization, person, and the entire pro-life movement. Pray also for wisdom to prevail as these difficult but crucial issues are dealt with in Austin and in hospitals. I hope this helps and I thank you for reading.